Here is another Star Castle update. The game is now playable, although more tuning is required and there are some rough edges. More awesome graphics by Nathan - especially the title screen and ring explosion! As before, you need Stella 3.5.5 or above to play. I haven't yet produced a version that is playable on the Harmony cart. The biggest issue remaining is the sound effects. I'm not very good at manipulating TIA audio, so if anyone can produce a closer match to the arcade effects then I'll be very grateful for the help! I've included the source code this time, although it is still a mess! Let me know if you have any comments, suggestions, bug reports, etc. Thanks - that is a happy side-effect of the way that the rings are drawn, rather than a deliberate feature! The attention to detail is phenomenal. It can only get better from here on out. So, where do I deposit this $32,000 I have waiting for someone to develop this? 'Wow' is the best way to describe...! This is fantastic! Now let's please get that Harmony version. Regarding the sound.. Is it possible to hear the regular background sound and the engine thrust simultaneously? Or is this a limitation of the hardware? I know asteroids behaves this way when firing. Which version of Stella are you using? Does it get past the "Get Ready" message if you press fire? The 2600 has just 2 sound channels, so it isn't possible to play more than two sounds at the same time. I have some sound effects set to one of the channels and some on the other. The engine thrust and background hum are indeed on the same channel, so you will only hear one at a time. Ok, Just updated Stella and it plays just fine! Awesome!!! It gets real hard as soon as it starts shooting back!!! LOL!!! Ok, Just updated Stella and it plays just fine! Awesome!!! It gets real hard as soon as it starts shooting back!!! LOL!!! The arcade game gets really hard after just the first castle, so balancing out the difficulty in the 2600 version will be tricky. On the one hand, you don't want it to be so hard that it puts people off from playing it, but on the other hand, you don't want to bore fans of the arcade version either. Maybe its time to start thinking about game variations to increase replay value. E.g. different levels of enemy response and aggressiveness, auto repairing or faster rotating rings, varying frictions, deadly when touched rings, different starting levels... something like that. BTW: Not sure if that's a cheat, but if you position your ship very close to the outer ring targeting the center and then start shooting as fast as you can, you quite easily get through all three rings and kill the enemy. I have some sound effects set to one of the channels and some on the other. The engine thrust and background hum are indeed on the same channel, so you will only hear one at a time. How about a sound priority system? So each sound can use any of the two channels if his priority is higher than the currently played sound. As for difficulty levels. Speed and thrust power of your ship is a good thing to change. Number of shots, auto-fire, wrap-around. Speed of overall game. Things like that. Early Atari published games had tons of variations, Missile Command had more than 30 and Asteroids and video olympics more than 50 each. It seems many 3rd party games have few if any variations. This applies to corporate-produced pro games BITD, and more recent individually programmed games. Perhaps it was an Atari-only thing to have billions of variations per game? Not sure if that's a cheat, but if you position your ship very close to the outer ring targeting the center and then start shooting as fast as you can, you quite easily get through all three rings and kill the enemy. Not so much a cheat, as something that needs to be tweaked. Chris has made the sparks (the little guys) come out sooner, which has helped with that some, but really they don't become much of a threat until after Wave 5. In the arcade game, they come out sooner, and get really aggressive by the second wave. They also seem to get more aggressive the longer a wave lasts. Right now, I'd save Wave 5 is about equal to Wave 1 in the arcade, and Wave 10 is about equal to Wave 2. 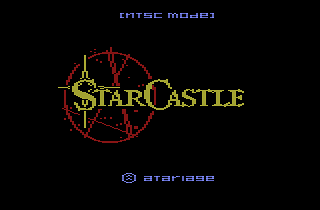 But I'm not a very good Star Castle player, and I suppose it also depends on which ROM set you played in the arcade. I created a FA2 bankswitch file and posted it to the Harmony forum so you can concatenate it with the SC binary to create Harmony versions with a .cu extension. I created a FA2 bankswitch file and posted it to the Harmony forum so you can concatenate it with the SC binary to create Harmony versions with a .cu extension.Let me know if there are any issues. Many thanks - I was going to PM you as I had forgotten how the CU format works.